Entering the plot through an automatic sliding door with a separate pedestrian entrance to a double, semi-covered carport and beautifully landscaped garden with olive trees and cypresses, securing privacy in a natural way. There is a separate storage space underneath the carport area designed for use of maintenance appliances and materials. The ground floor level consists of an open plan space combining living, dining and kitchen area. The spacious island kitchen is finished with luxurious Calacatta marble elements and Gaggenau appliances. The dining is set in the impressive double high ceiling space, with its floor to ceiling windows enhancing the feeling of space and light. The living area is decorated with a wall covering cabinet wall with integrated television and ethanol fire place. 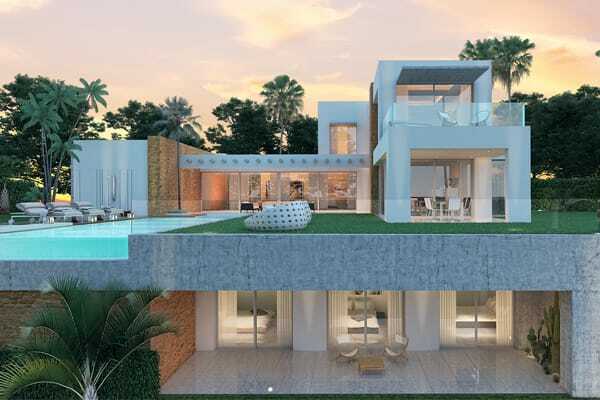 Large covered terraces complement outdoor living, offering privacy, all overlooking the spectacular infinity pool with garden and the stunning views on golf and Mediterranean. The large basement covers a total built space of 303 m2 with air-conditioned bodega, technical rooms, laundry room and two more bedrooms with bathroom en suite. One of those is a large 45 m2 bedroom with two high windows and French balconies, overlooking the golf area and Mediterranean. The large open plan space (95 m2) next to the staircase and elevator is ideal for creating a gym, wellness, home cinema or extra bedrooms. 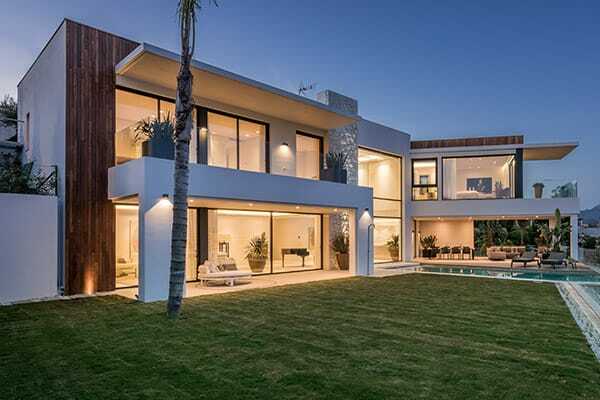 Spectacular 6 bedroom contemporary villa with amazing panoramic views on golf and Mediterranean. High quality and secured aluminium double glazed windows. Oversized Italian ceramic tiling interior & exterior areas. Selection of high quality, sanitary items by Italian & German brands. Underfloor heating throughout ground and first floors. Interior carpentry with hidden hinges, soft closing, floor-to-ceiling height (2.30 m) and seamless joints. Interior decoration with a beautiful blend of modern Italian pieces with warm fabrics, tree tables and elegant decorations. Solar powered energy system and hot water circulation pump. Spectacular infinity pool with LED RGB lighting and water treatment. Pre-installation for heating and automatic floating cover. Ethanol fireplace integrated in wall panelling. Electronic controlled Bandalux sunscreens on first floor areas, double ceiling window and curtains on ground floor. Domotics system with lighting, screens and curtains control, a fully integrated sound system by Sonos ® and connectivity through Apple HomeKit ® . Air-conditioned bodega in basement . Architectural lighting interior, exterior and garden. Modern and tropical landscaped gardens with different levels on the slope.